Weather is always crazy everywhere. I know it is a conversation starter when meeting strangers, but I rarely use it. However, I have lived some years in three different states and by far winters in Georgia are the most surprising and wildly unpredictable. Friday January 6th, we were preparing for a winter storm, which in my area was mostly sleet so we were iced in for the entire weekend. Although some of the ice melted on the main roads because of the sunshine on Saturday, temperatures remained mostly in the 20's and our driveway is on the north side of the house...well, whatever somewhat melted refroze and made it even slicker the next morning. Sunday we were promised the temperature would go above freezing. Did not happen, of course! So finally on Tuesday the temperatures were in the 50's and now for the last two days, it has been nearly 70° F, just a week later. Taking our half-grown puppy out was quite challenging. Finding a safe path to the rabbits was as well. The cats both took one step onto the icy driveway decided that staying cooped up in the warmer garage was not such a bad idea after all. Midnight did not even scratch at the basement door as she usually does when she wants out or just attention. The full bright moon on a cloudless night and Venus giving her all against the black of the southwestern sky just after sunset. 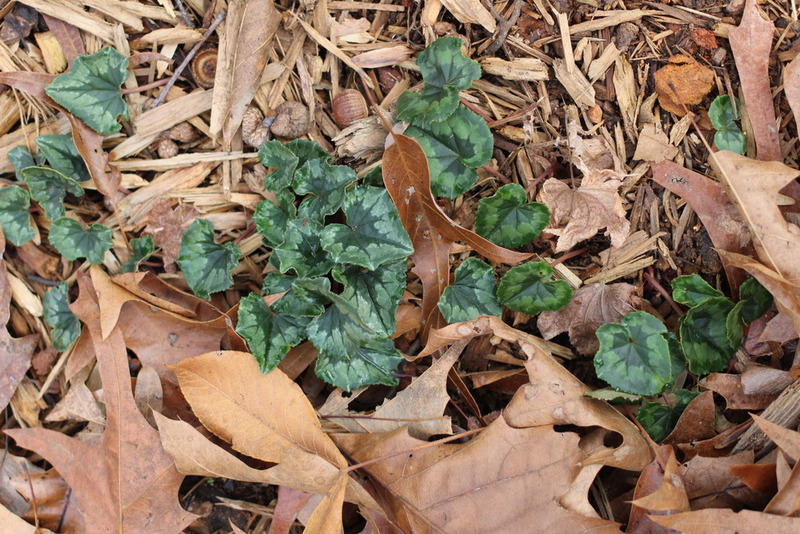 I thought I had lost these sweet greens in the drought, but my little cyclamen plants announced their survival peeking out of the leaves even after being iced. The the best one was my husband is home for the weekend and we are having a date night, because our daughter is staying over night with a friend. We are talking about Sushi for dinner and just being together alone for the first time in months. My Lord, thank you for taking care of us every day and in every way through all kinds of hardships.